DMS Scaffolding are happy to supply and erect any type of scaffold required for domestic, commercial or industrial applications. Our team of scaffolders supply to businesses, building contractors and private clients. No job is too small, big, or too difficult as we can supply and erect the correct scaffolding for the work in hand. We specialise in loft conversions erecting scaffolding in a safe and secure manner. 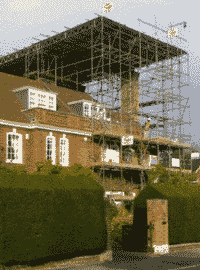 Whatever your building project, if you need to hire scaffolding, we can help. DMS Scaffolding will design and build a structure suitable for the building project, erect the system in accordance with the relevant legislation then remove on completion of the project. We can erect cradles and access towers and are available for any immediate emergency work. A Complete Scaffolding Hire, Supply and Erecting Service. We are suppliers of all aspects of scaffolding required including design work, shoring and temporary roofs, stocking both traditional and cuplock system scaffolding, and have ample stocks of accessories such as aluminium beams, towers and temporary staircases. Scaffold Design service, Erecting service, Collection service. Emergency and temporary structures. Chimney scaffolding, Stage scaffolding, Exterior scaffolding, Guttering scaffolding, Support System scaffolding suppliers. Access towers, Access bridge scaffolds, Platform gantrys, Shoring, Internal bridging, Temporary roofs, Re-decoration. A complete scaffolding hire and supply service. Specialists in loft conversions.